Flash crashes. Speed dating. Instant messaging. From the devices we carry to the lives we lead, everything is getting faster, faster. But where did this great acceleration come from? And where will it lead? 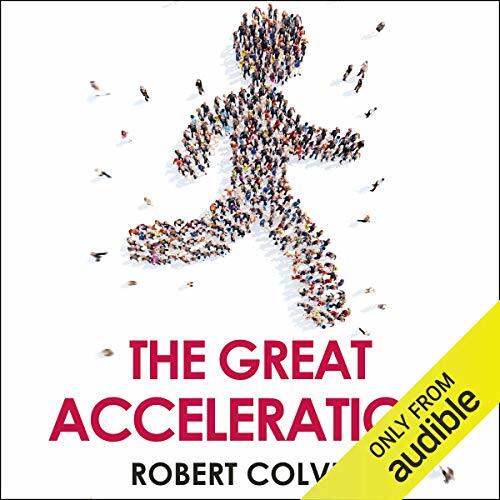 In this vitally important new audiobook, Robert Colvile explains how the cult of disruption in Silicon Valley, the ceaseless advance of technology and our own fundamental appetite for novelty and convenience have combined to speed up every aspect of daily life. Drawing on the latest research, this book traces the path of this acceleration through our working and social lives, the food we buy and the music to which we listen. It explains how it's transforming the media, politics and the financial markets - and asks whether our bodies, and the natural environment, can cope. As we race towards the future - into a world packed with new technologies, new ideas and new discoveries - this scintillating and engrossing book is an invaluable, must-listen guide to the wonders and dangers that await us. After reading/listening to many Ai or automation books etc there was little to be learned from this book but it was entertaining. Throughout The Great Acceleration, Colvile asserts that the advent of the Web, emails, texting, blogs, and various forms of social media has ushered in an unprecedented flourishing of the written form of the English language. Really? LOL 😀😊😀 OMG RUS? Of course no one can predict the future it's always an educated guess. We all feel things are getting faster however after reading this book you will observe things better. Some other reviewers were earked by the fact that the author puts a silver lining around all these changes IMO the author implied the good comes with the bad.